In the Olivier, all the bedrooms are on the second floor, and at the very top of the chalet is an open-plan living/dining area with a cosy central fireplace. During afternoon tea on the sun terrace, you can enjoy watching the last skiers carve their way past the chalet on their final home run. We update Chalet Olivier's details often, but facilities do change. e.g. some extras listed by the supplier as "free" or included might only be for the first time you use them, or for one time per party, then charged for further use. If any specific feature is essential to your holiday, make sure you ask us to confirm the details of it before you book your holiday. This package holiday to Chalet Olivier in Val Thorens, France departs Sunday 22nd December 2019, for a 7 night stay on a "catered chalet" board basis. A local tourist tax (Taxe de Sejour or Kurtaxe) is levied by many councils in European ski resorts. It varies by standard and type of accommodation and is age dependent, so not everyone is charged. It's not included in the basic price of your holiday and is usually paid locally. For reference, the average charged in winter 15/16 was between 50p and £2 per person, per night. Val Thorens lift pass price last reported as €208 (Adult 6 day). Ask for a quote when booking Chalet Olivier. 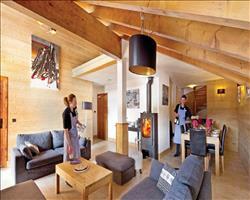 Chalet Chloe Val Thorens France, Gatwick to Chambéry 22nd December. "Very nice chalet with the perfect location in Val T"
This is a really, really good chalet. I’ve never seen a better location! It’s great for families – it’s close to a soft play area, the swimming pool, shops and cafes, etc. There is also a nursery very nearby with an outside play area which would be good for people travelling with young children. The chalet is also just over the piste from the nursery slopes and lifts, and for people who have skied a little before it’s ski in / ski out. You can literally put your skis on outside the chalet and ski down a fairly easy run, no walking necessary at all. Overall we would definitely stay there again. The living area was nice and spacious, however the rooms were quite small and the bathrooms were basic. We took sole occupancy of the chalet, but I could imagine that if you came here and shared the chalet with other guests you might find the rooms a little cramped. We were a bit unfortunate with our chalet hosts this time, initially they were rubbish. We’ve been away before with the same company and usually their hosts are good, but this time we had to contact the area manager to let them know the hosts weren’t up to scratch. After that the manager came round and made sure that the cleaning was done properly and the hosts’ attitude changed. It’s always important to remember that the hosts change every year anyway, so it doesn’t stop me from wanting to come back here. The food was lovely. We did find that the children’s meals were a bit on the small side, but again I think this was down to the hosts. We’ve never found the children’s meals small before with this company. We noticed that some of the Trip Advisor reviews said that the hot water ran out at times in the chalet, but we never had a problem with this and our group filled the whole chalet. The cooking was absolutely brilliant and we had perfectly good food. The chalet girl who was cooking (whose name I can’t remember) was fantastic, but she was pretty much on her own. The staff were continuously changing and the young boys who supported her literally didn’t know how to peel a potato… it would take days for them to do a simple job. They all worked really hard and it was more a question of the strain on them caused by bad management. The cleanliness of the chalet was basically ok, although a lot of things were broken (for example the light on the mirror in my bathroom). The location was absolutely fine, I got from the chalet to the piste in about 15 seconds and the shops and bars were right next door. Val Thorens is a university ski resort and some of the chalet guests staying on the other side from me complained about the noise, but I slept perfectly fine all week. "Heady mix of high standards and high altitude"
Its top location just off piste makes this ski in/out catered chalet a favourite amongst keen skiers and snowboarders who love the high altitude and fast access into the vast Three Valleys that are the hallmarks of a ski holiday in Val Thorens. At the end of the day you can enjoy the beautiful views and the final skiers making their way past you down the slope. With three and four course dinners served in the evening with a nicer quality of wine than the average chalet fare, you get to relax in the large open plan dining area together and tell tall tales of derring-do on the snow. The food is yummy, the chalet's hosts are friendly and knowledgeable... and its all capped off with doorstep snowboarding and skiing.